A modern burial experiment was devised to test microscopic residue survival in acidic peat and slightly acidic clay soils at the Early Mesolithic site of Star Carr (North Yorkshire, UK), and at nearby control location. 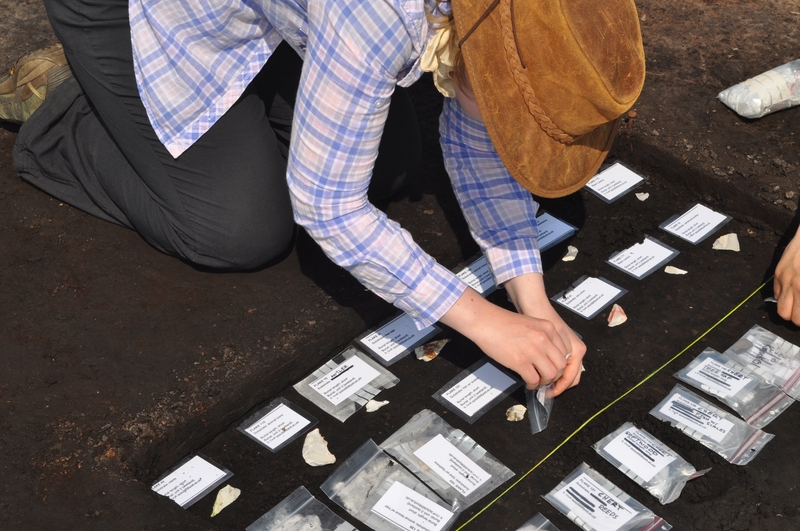 The experiment addresses concerns regarding the applicability of residue analysis in varied burial environments, and particularly in highly acidic archaeological conditions. Flint flakes (n= 78, including blank controls) were used on twelve plant, animal, and mineral materials to create residues and then buried. The residues were examined 1 month and 11 months after burial. An unburied reference collection containing the same twelve residue types in a fresh state was compared to the buried residues to assess diagenesis. The residue types that survived across all burial conditions and time intervals were: softwood tissue, tree resin, bird feathers, squirrel hair, and red ochre. During microscopic analysis, it became clear that many residues lack diagnostic traits, and thus an assessment of the extent to which each residue can be identified was conducted. The degree to which residues were able to be identified was further investigated with a variable pressure scanning electron microscope (SEM). SEM images of the reference residues were compared to the reflected VLM micrographs of the same residues, which improved characterisation in some cases. Residues were grouped into three categories (diagnostic, distinctive, and non-distinctive) within a visual characterisation guide. Our in situ microscopic analyses indicated that few residue types have diagnostic traits that allow them to be identified unambiguously, and thus further characterisation techniques are often required. Key Finding 1: Few of the residue types examined have diagnostic morphological characteristics that allow them to be identified in situ by reflected VLM alone; many residues are ambiguous and require further techniques for identification. The open access publication costs for this article came from the Archaeology Department Research Fund, University of York.